As you walk through the exhibition Premiere: New acquisitions at Library and Archives Canada, you will see two items from Library and Archives Canada’s (LAC’s) Rare Book Collection. One is a short medical pamphlet published in Quebec in 1785 that explains the symptoms and treatment of a disease thought to have been a form of syphilis. 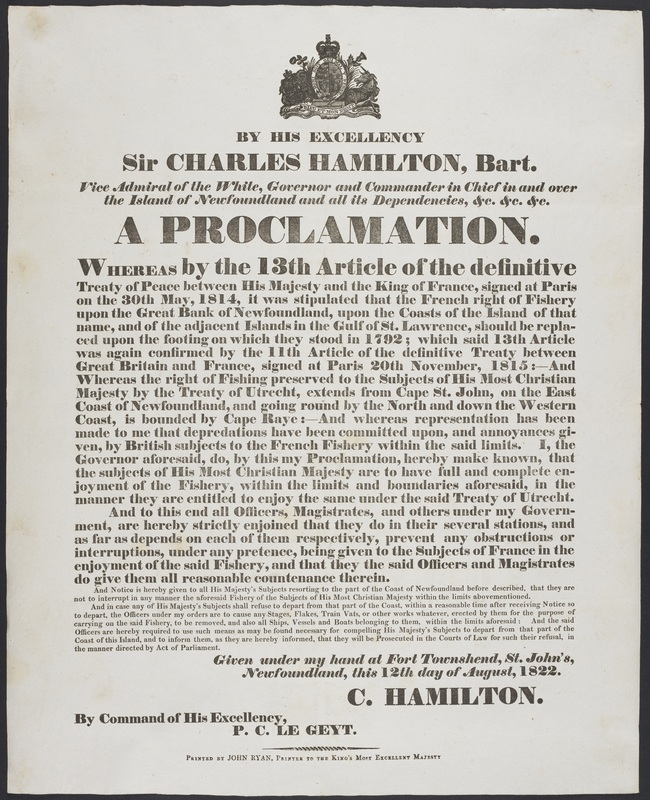 The other is a proclamation on the subject of French fishing rights, issued by the Governor of Newfoundland in 1822. These two publications may not appear to have much in common. In fact, though, they share an interesting historical connection: both are the work of the first printers in their respective provinces. William Brown, publisher of Direction pour la guerison du mal de la Baie St Paul [A guide to treating the Baie St Paul malady], and his partner, Thomas Gilmore, became the first printers in the province of Quebec when they set up shop at Quebec City in 1764. John Ryan, who produced the Newfoundland broadside, holds the distinction of having been the first printer in two separate provinces. Ryan and his partner, William Lewis, were already in business in Saint John when the province of New Brunswick was created in 1784. Ryan then relocated to St. John’s, Newfoundland, in 1806, and opened the island’s first press. Johann Gutenberg introduced printing to Europe in the middle of the 15th century, completing his famous Bible in Mainz, Germany, around 1454. By 1500, Gutenberg’s innovation had been adopted widely in Europe. European colonists then transported printing technology to the Americas. It was not until 1751—almost 300 years post-Gutenberg—that the first press reached Canada. This alone seems to us like an incredibly lengthy interval, accustomed as we are to rapid changes in technology. But it actually took close to another 150 years for printing to spread to all regions of the country. Through holdings like these items printed by William Brown and John Ryan, LAC’s Rare Book Collection documents the long and fascinating history of how printing made its way across Canada. This history begins with John Bushell, Canada’s first printer. In 1751, Bushell moved from Boston, Massachusetts, to Halifax, Nova Scotia. There, he published the country’s first newspaper, The Halifax Gazette, on March 23, 1752. As previously noted, Quebec and New Brunswick got their first presses in 1764 and 1784, respectively. By the end of the 18th century, printers had come to Prince Edward Island and Ontario, where Louis Roy established the first press in Newark (Niagara-on-the-Lake) in 1792. After John Ryan’s arrival in Newfoundland in 1806, there were presses in all of the eastern provinces. Many early eastern Canadian printers, including Ryan and Prince Edward Island’s first printer, James Robertson, were Loyalists—Americans who left the United States during the American Revolutionary War out of loyalty to the British monarchy. The advent of printing in Western Canada and the North occurred before the close of the 19th century. In both Alberta and Manitoba, the first printers were missionaries who produced Indigenous language translations of Christian religious texts. Using a makeshift press and type he had cast himself, Methodist minister James Evans started printing in Cree syllabics at Rossville, Manitoba, in 1840. The Oblate priest Émile Grouard brought the first press to Alberta when he settled at Lac La Biche in 1876. In 1878, Grouard completed the province’s first book, entitled Histoire sainte en Montagnais (“Montagnais” was the term non-Indigenous people used for the Dene language). That same year, Saskatchewan’s first printer, Scottish-born Patrick Gammie Laurie, began publishing his newspaper, the Saskatchewan Herald (AMICUS 4970721), in Battleford. Laurie had walked to Battleford from Winnipeg—a distance of about 1000 kilometres!—leading an ox cart that carried his press. The Fraser River gold rush lured prospectors to the west coast in 1858. A demand for printed news accompanied this influx of people, resulting in the establishment of British Columbia’s first five newspapers, all in Victoria. One of the five was The British Colonist (AMICUS 7670749), founded by the future premier of British Columbia, Amor de Cosmos. Gold also spurred the introduction of the press to Canada’s northern territories. 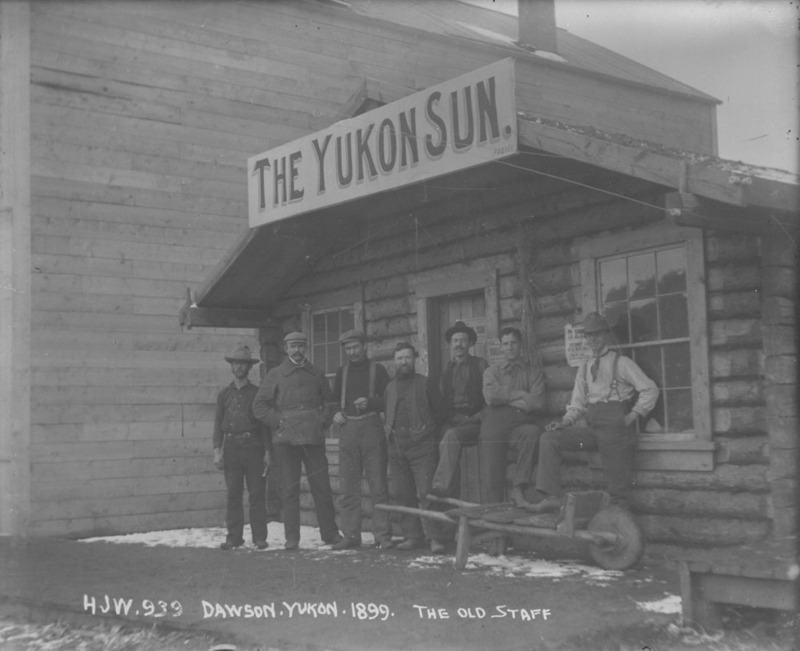 During the Klondike gold rush in 1898, printer G.B. Swinehart left Juneau, Alaska, with the intention of starting a newspaper in Dawson City, Yukon. Swinehart’s journey stalled at Caribou Crossing due to the weather, so he published a single issue there while he waited. This paper, the Caribou Sun (AMICUS 7502915) for May 16, 1898, is the first document known to have been printed in Canada’s North. LAC’s published collection holds a lot of early Canadian printed material, including over 500 items printed in Canada before 1800. This is a significant number, but the collection still has many gaps. It is always exciting for LAC staff when we come across imprints that aren’t already in the collection because documents printed by Canada’s first printers tend to be very rare. The two publications featured in the Premiere exhibition are good examples. 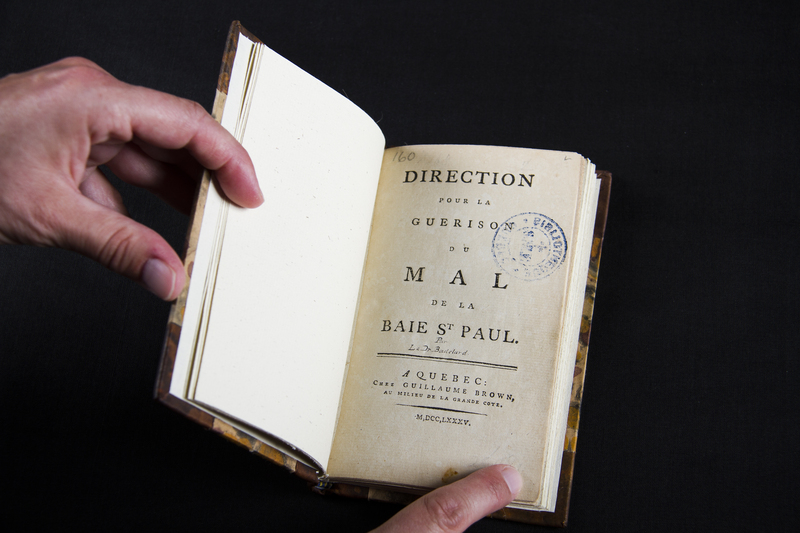 Only about five copies of Direction pour la guerison du mal de la Baie St Paul survive today. 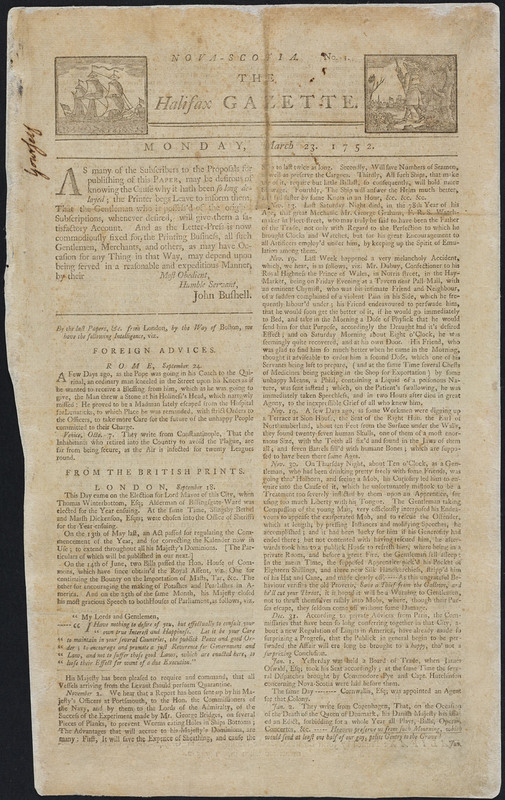 The John Ryan broadside was previously unrecorded, meaning that no other copies are known to exist. If you’re in the Ottawa area, check out Premiere: New Acquisitions at Library and Archives Canada to see these rare early Canadian imprints in person, along with new acquisitions from other parts of LAC’s collection. The exhibition runs at 395 Wellington Street in Ottawa until December 3, 2018. Admission is free! Meaghan Scanlon is Senior Special Collections Librarian in the Published Heritage Branch at Library and Archives Canada. This entry was posted in Exhibitions, Library and tagged exhibition, Premiere series, published material, Rare books by Library and Archives Canada Blog. Bookmark the permalink.